Following a lengthy trial, the pair were found guilty of copying the late music icon’s song Got to Give It Up for their track Blurred Lines. 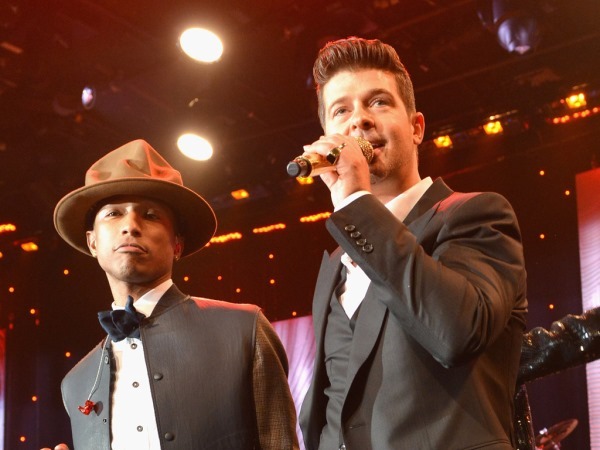 But on Wednesday, Robin and Pharrell’s lawyer Howard E. King confirmed they are planning to appeal. "We owe it to songwriters around the world to make sure this verdict doesn't stand," King told Fox Business Network. "My clients know that they wrote the song Blurred Lines from their hearts and souls and no other source. We are going to exercise every post trial remedy we have to make sure this verdict does not stand. We look at it as being in the seventh inning of a game that could go into extra innings." Following the guilty verdict, Marvin’s family were awarded nearly $7.4 million in damages, with the late singer’s daughter Nona explaining how jubilant they are. "It’s a beautiful day when you can sit in a courtroom and have justice stand," she told New York Daily News. "I feel free from the pain. It felt like a painful joke, those two years knowing our song was copied and not getting any serious feedback from their side. That’s our father, that’s what he left for us, our legacy." Marvin's children started legal proceedings in 2013. While Pharrell and Robin lost their case, the jury found T.I. (real name Clifford Harris Jr.), who features on the record, was not involved with copyright infringement.